This old fashioned Red Velvet Cake recipe is moist and fluffy. It’s frosted with classic Ermine icing and gets its red color from beets which is how this classic cake was originally made. How was red velvet cake originally made? 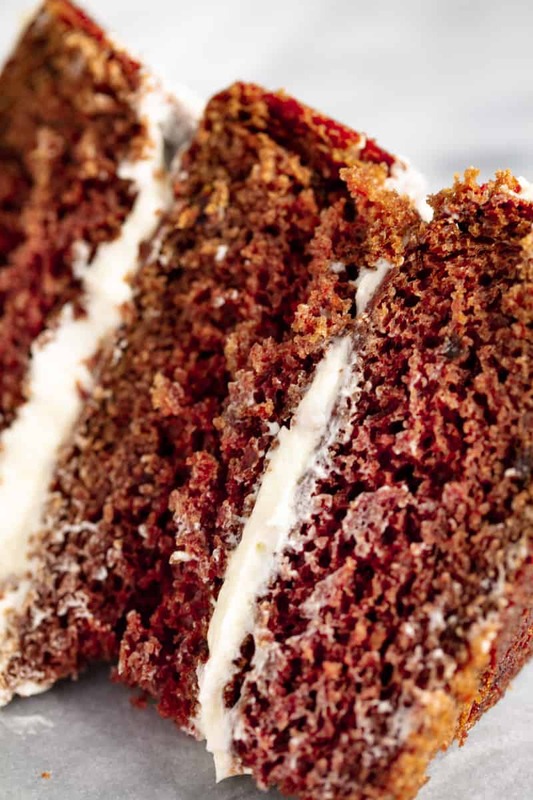 The original red velvet cake was made with beets which gave the batter and cake a slide red tint to it. The original red velvet cake is NOT bright red in color, and instead only has a subtle redness to it. Originally, red velvet cake had a slightly sour taste to it with just a hint of chocolate. It is not simply a white cake dyed red, nor is it a chocolate cake with a red tint. The flavor of red velvet cake is distinct and unique. 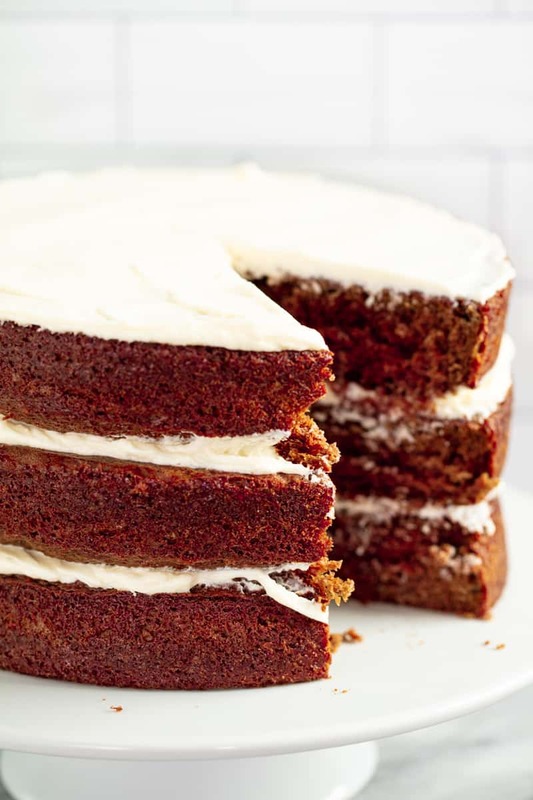 Red velvet cake was also originally frosted using Ermine Frosting, though it is commonly made using cream cheese frosting today out of convenience since Ermine Frosting is a cooked frosting. Is there a substitute for buttermilk? Buttermilk is a key component in this cake recipe. If you don’t have access to buttermilk, please use a buttermilk substitute. There are lots of options and you are sure to find one that you can make work HERE in our article on buttermilk substitutes. What is the difference between chocolate and red velvet cake? 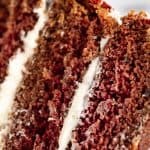 This red velvet cake is based off of the recipe for The Most Amazing Chocolate Cake so there are some similarities, but there are also several key differences that gives Red Velvet Cake its unique flavor and texture. Red velvet cake has less cocoa powder added to it so the chocolate flavor is much more mild. Both our chocolate cake and red velvet cake use buttermilk, but buttermilk is a required ingredient for red velvet cake. It also has vinegar and red food coloring added to it to add acidity and the classic red coloring. How much batter does this recipe make? Can I bake it in different sizes of pans? How can I get a richer red color to my red velvet cake? The original Red Velvet Cake only had a slight red color to it which came from pureed beets. If you want a richer red color, without the use of food coloring, you can make a liquid dye to use in place of the water in this recipe. Add 1 cup of shredded beets to a small saucepan and fill with 1 1/2 cups of water. Bring to a boil over high heat, then reduce the heat to medium-low. Let simmer 30 minutes. 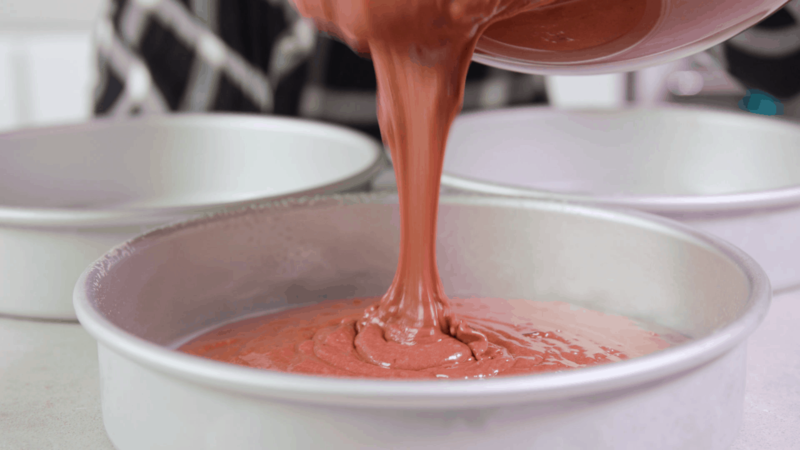 Strain liquid, reserving 1 cup of the red water for use in the cake. You can also reduce the amount of cocoa powder in this recipe by half, however, this will impact the overall flavor of the cake. This old fashioned Red Velvet Cake recipe is moist and fluffy. It's frosted with classic Ermine icing and gets its red color from beets which is how this classic cake was originally made. Preheat oven to 425 degrees. Wrap beet in foil and roast until tender, about 1 hour. Reduce heat to 375 degrees for baking cake once beet is cooked. Butter three 9-inch cake rounds. Dust with flour and tap out the excess. Remove roasted beet from foil. The skin should easily slide off the beet. Discard skin and place beet into a large mixing bowl. 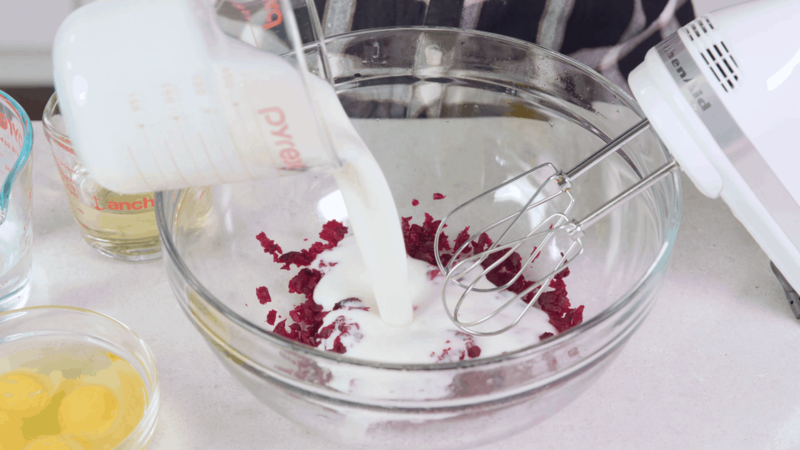 Use a hand mixer to whip the beet into mush. Add eggs, buttermilk, warm water, oil, vanilla, and vinegar and beat until combined, about 1 minute. Add in flour, sugar, cornstarch, cocoa, baking soda, baking powder, and salt in a stand mixer using a low speed until the mixture is smooth. Divide batter among the three prepared pans. Bake for 30-35 minutes until the cake meets the toothpick test (stick a toothpick in and it comes out clean). Cool on wire racks for 15 minutes and then turn out the cakes onto the racks and allow to cool completely before frosting. In a medium sauce pan, whisk together flour and sugar over low heat. Cook for 2 minutes. Slowly whisk in milk and bring to a boil. Cook until thickened into a pudding-like consistency, about 1 minute, and then remove from heat. Pour into a bowl and place plastic wrap directly on top of the mixture so no skin forms. Set aside. 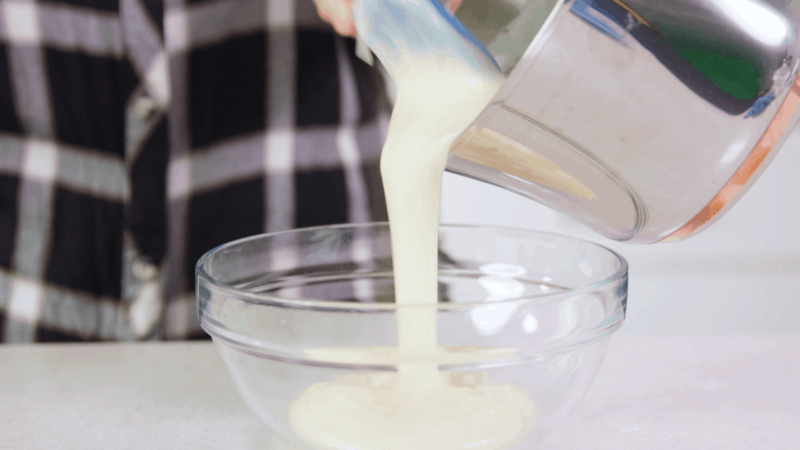 In a large bowl, use a hand mixer to whip butter until light and fluffy, about 2 minutes. Add in cooked milk mixture 1 to 2 tablespoons at a time, mixing well between each addition. Once all milk mixture has been added in, beat in vanilla and salt and continue beating until the frosting is thick and creamy and everything is well mixed in. Assemble and frost the completely cooled cake. *The video and photos in this recipe feature a cake that was only frosted between layers. The written recipe provides enough icing to cover the entire cake. If you only want to frost in between layers as shown in the pictures, you can easily halve the Ermine Icing ingredients.